Ancient History and Archaeology.com - What Did the Romans Eat? Judging by the evidence of recipes and carbonized shopping lists from Pompeii, the average Roman family’s diet would have been simple and nutritious. Some recipes may not be to our taste. But several other everyday Roman dishes have survived to the present day. Traditionally spelt was the cornerstone of the Roman diet. Known to the Romans as far, it had multiple uses. As flour or farina it could be baked into bread or panis. Alternatively it could be made into puls, a kind of porridge which was one of the oldest traditional Roman dishes. Spelt flour was also used to thicken sauces or to form the basis of sweet dishes such as tractum which was used in pastries and biscuits. The agricultural texts of Cato and Columella are full of recipes for other types of grain. Millet, wheat and barley were all staples of the agricultural diet. They were either boiled and eaten plainly or flavoured with cheese, honey, eggs or milk. These porridges remained popular well into the empire with those of simple culinary tastes as well as the poor, who would have relied upon such economical dishes for survival. Rome was well supplied with produce from the purpose built market gardens that sprang up on the city’s outskirts. Evidence indicates that lentils, chickpeas, beans, onions, leeks, celery, turnips, onions, garlic, carrots and parsnips were favourite household vegetables. But there were more exotic additions to on sale in the city’s markets. Imported food stuffs such as dates were affordable and readily available. Pulses were the basis of many dishes because they were available and versatile. They could be ground to form flour; lomentum was one version made from broad beans. Pulses could also be served in salads with herbs and cheese or in stews and soups. They also made excellent snack food. Chickpeas were soaked and then oven roasted and salted, to be eaten like peanuts. Cheese, like vegetables, was readily available and commonly used. It could either as fresh curds or preserved. Curd cheese was often mixed with herbs or sweetened with honey and nuts. Preserved cheese was pickled in brine or vinegar, salted or smoked. Olive oil and wine were the most frequently served condiments for food. Wine would be boiled down to form sapa which was used as the basis of the many sauces served on the side with Roman meals. Herbs and spices were regularly added to these sauces, as well as fruit and honey, lending dishes a strong sweet and sour flavour. Garum is probably the most infamous of the Roman condiments and was the ancient version of tomato ketchup. Also known as liquamen, garum came in various different grades of quality. It was manufactured commercially by fermenting mackerel and other fish in huge vats. Such was its popularity, it was transported all over the Roman Empire. However, garum does not feature as an ingredient in ordinary recipes where salt was more commonly used. It does feature however in the recipes of Apicius’s elaborate dinner party cookbook which suggests it was a more expensive elite condiment. Meat Eating and the Romans. Despite literary descriptions of grand Roman dinners, the common Roman diet include very little meat or fish. With time, it did become more affordable and most people could only afford to eat meat once a week. It was also common for modest dinner party menus to include at least one main meat dish. But it was considered to be vulgarly ostentatious to serve meat with every course, as Petronius’s Trimalchio did at his famous dinner. Popular meats included pork, lamb, game and beef, as well as chicken and goose. Dormice and wild birds such as thrushes and figpeckers were also eaten as delicacies. The entire animal was used. Whilst whole roast suckling pigs could be served at feasts, so could thriftier dishes of offal in sauce. Sausages were also popular. Fish was rare and so therefore costly, except for those living in coast regions. Despite its close proximity to the sea, Rome did not have a ready supply. Fish stock that was available in the city’s markets was commonly sold live from huge tanks. Eels, anchovies and sardines and mullet were all popular choices. 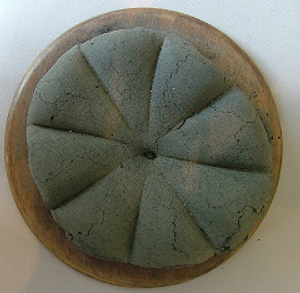 Laganon was the ancient version of pasta, made from wheat flour mixed to dough with water. Unlike modern pasta, it was fried and not boiled and used to scoop up the vegetable sauce usually served with it. Ancient Pesto. Columella describes a sauce made or ground pine nuts, hazelnuts or almonds, mixed with oil, peppered vinegar and cheese, with thyme, oregano or savory.